and of course, Happy Weaving! PS – I’ve been asked for more ‘process’ information and background…….so…..here goes. I really like the feeling of this picture and the colours are different than my usual and favourite palette – for me that’s good for a challenge. I had this warp in golds and burgundy and other shades left from a class that I did. I set this warp up for someone else who I knew liked these colours – and it was also set up for a ‘Cool Cross’ scarf. My initial thought was to weave a cool cross as it would reflect the photo. However, right now I have been playing with loose weaving – leaving lots of space – to remind me to leave space in my life – for the unexpected, unplanned things. So this bit of weaving has turned into something unexpected and unplanned as a result. See my other P2P2 posts here and what everyone is doing here. Wow! You’ve captured an essence of the moment in Bhutan. The colours in the weave are very expressive. Like the way you stepped out into the unusual! 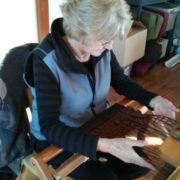 I also tend to gravitate towards certain palettes, but since starting Saori Weaving have discovered the freedom to play, challenge, and well, just not know what the space will bring. Had a great guide! This weaving reflects the softness and naturalness and simplicity of the image so well! What i love most about Saori weaving is that it can be trusted! I don’t know any other way to say that. I recently found this out when i decided to create a small weaving for a friend in colors she uses in her space – colors that are about as far from my own color preferences as it is possible to get! I pulled the yarns together and let the weaving direct me from that point on. And the result is beautiful! Apparently you have just had a similar experience with this piece. And look at how beautiful your weaving is! The loose weaving really worked well with the colors. Completely different from most of your previous work.